Pineapple and coconut milk bring tropical flavors in this tropical strawberry smoothie that will instantly brighten your mood! End of winter always calls for tropical flavors. 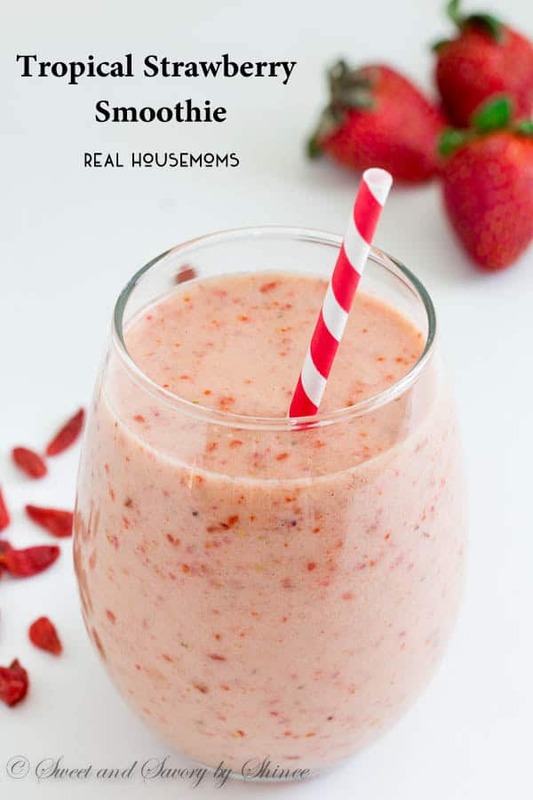 The quickest and easiest tropical flavored treat, that I could think of, is smoothie. Throw in some pineapples, coconut anything, lots of fruits in to the blender. And BOOM, you’ve got the most refreshingly delicious drink in your hands that will transform your mind into a sunny warm place. Hawaii, anyone? In all seriousness though, this smoothie’s only goal is to brighten your mood with its fruity, sweet taste. Forget about protein-packed, loaded-with-greens, skin-glowing blah-blah smoothies for a moment. 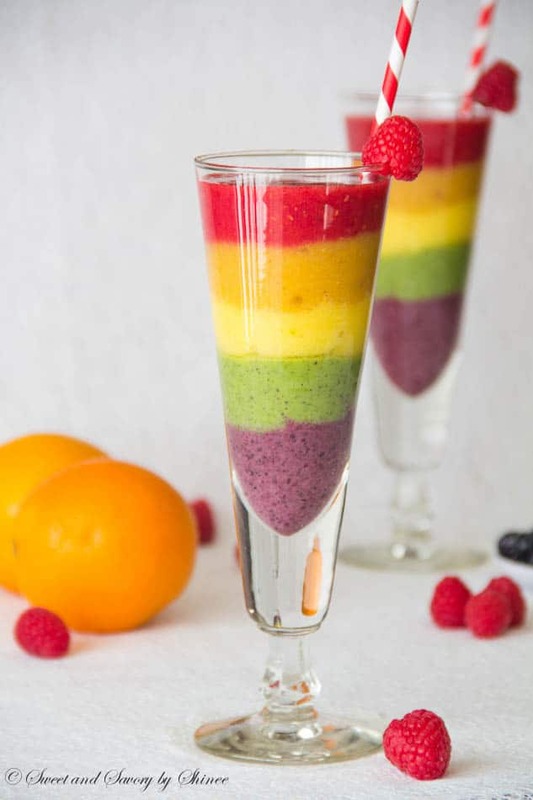 Let’s just focus on feel-good, taste-good smoothie today, ok? My secret ingredients for the creamiest smoothie are frozen pear and Greek yogurt. Did you know that frozen pear is perfect substitute for frozen banana? 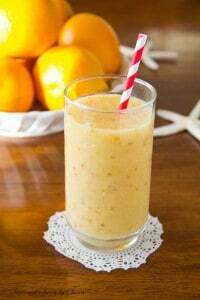 Yep, it adds thick and creamy texture without overpowering the smoothie with banana flavor. And Greek yogurt is just a must in all of my smoothies. I usually use full fat unsweetened, or honey flavored, whatever I happen to have in the fridge. 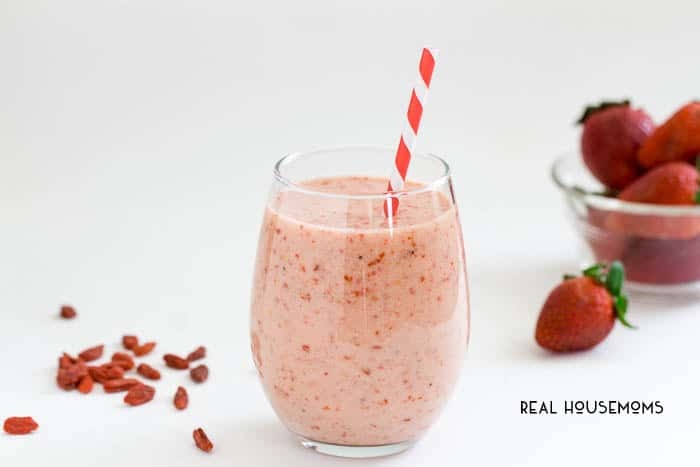 Pineapple and coconut milk bring tropical flavors in this strawberry smoothie that will instantly brighten your mood. Throw all the ingredients in a blender and mix until nice and smooth. Enjoy! Note: If you find the smoothie not sweet enough for you, feel free to add a little honey. Thanks for amazing recipe! I love strawberry smoothie with coconut milk. With love!